Our Dorchester Range has a beautiful sculpted and refined design. Built in the UK on a hardwood frame with fibre filled seating for extra comfort. •	Our Dorchester Range has a beautiful sculpted and refined design. •	Dorchester sofa comes with scatter cushions shown on the picture. •	Built in the UK on a hardwood frame with fibre filled seating for extra comfort. •	Upholstered in a crushed velvet effect and is a hard-wearing polyester fabric. •	High quality materials guarantee quality • Ottoman available on separate listing. 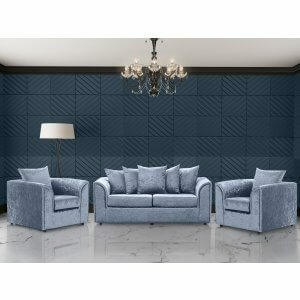 Blue Crushed Velvet 3 + 2 + 1 Seat Sofa Suite •	Our Dorchester Range has a beautiful sculpted and refined design. •	Dorchester sofa comes with scatter cushions shown on the picture. •	Built in the UK on a hardwood frame with fibre filled seating for extra comfort. •	Upholstered in a crushed velvet effect and is a hard-wearing polyester fabric. •	High quality materials guarantee quality • Ottoman available on separate listing. Cream Crushed Velvet 3 + 2 + 1 Seat Sofa Suite •	Our Dorchester Range has a beautiful sculpted and refined design. •	Dorchester sofa comes with scatter cushions shown on the picture. •	Built in the UK on a hardwood frame with fibre filled seating for extra comfort. 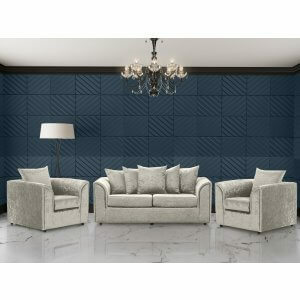 •	Upholstered in a crushed velvet effect and is a hard-wearing polyester fabric. •	High quality materials guarantee quality • Ottoman available on separate listing. Gold Crushed Velvet 3 + 2 + 1 Seat Sofa Suite •	Our Dorchester Range has a beautiful sculpted and refined design. •	Dorchester sofa comes with scatter cushions shown on the picture. •	Built in the UK on a hardwood frame with fibre filled seating for extra comfort. 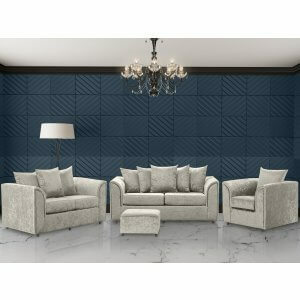 •	Upholstered in a crushed velvet effect and is a hard-wearing polyester fabric. •	High quality materials guarantee quality • Ottoman available on separate listing. Lavender Crushed Velvet 3 + 2 + 1 Seat Sofa Suite •	Our Dorchester Range has a beautiful sculpted and refined design. •	Dorchester sofa comes with scatter cushions shown on the picture. •	Built in the UK on a hardwood frame with fibre filled seating for extra comfort. •	Upholstered in a crushed velvet effect and is a hard-wearing polyester fabric. •	High quality materials guarantee quality • Ottoman available on separate listing. 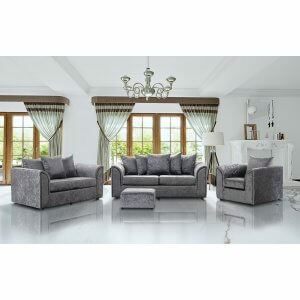 Mulberry Crushed Velvet 3 + 2 + 1 Seat Sofa Suite •	Our Dorchester Range has a beautiful sculpted and refined design. •	Dorchester sofa comes with scatter cushions shown on the picture. •	Built in the UK on a hardwood frame with fibre filled seating for extra comfort. •	Upholstered in a crushed velvet effect and is a hard-wearing polyester fabric. •	High quality materials guarantee quality • Ottoman available on separate listing. Blue Crushed Velvet 3 + 1 + 1 Seat Sofa Set •	Our Dorchester Range has a beautiful sculpted and refined design. •	Dorchester sofa comes with scatter cushions shown on the picture. •	Built in the UK on a hardwood frame with fibre filled seating for extra comfort. •	Upholstered in a crushed velvet effect and is a hard-wearing polyester fabric. •	High quality materials guarantee quality • Ottoman available on separate listing. Cream Crushed Velvet 3 + 1 + 1 Seat Sofa Set •	Our Dorchester Range has a beautiful sculpted and refined design. •	Dorchester sofa comes with scatter cushions shown on the picture. •	Built in the UK on a hardwood frame with fibre filled seating for extra comfort. •	Upholstered in a crushed velvet effect and is a hard-wearing polyester fabric. •	High quality materials guarantee quality • Ottoman available on separate listing. Gold Crushed Velvet 3 + 1 + 1 Seat Sofa Set •	Our Dorchester Range has a beautiful sculpted and refined design. •	Dorchester sofa comes with scatter cushions shown on the picture. •	Built in the UK on a hardwood frame with fibre filled seating for extra comfort. •	Upholstered in a crushed velvet effect and is a hard-wearing polyester fabric. •	High quality materials guarantee quality • Ottoman available on separate listing. 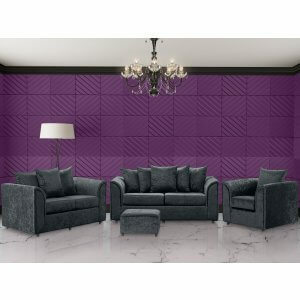 Lavender Crushed Velvet 3 + 1 + 1 Seat Sofa Set •	Our Dorchester Range has a beautiful sculpted and refined design. •	Dorchester sofa comes with scatter cushions shown on the picture. •	Built in the UK on a hardwood frame with fibre filled seating for extra comfort. •	Upholstered in a crushed velvet effect and is a hard-wearing polyester fabric. •	High quality materials guarantee quality • Ottoman available on separate listing. 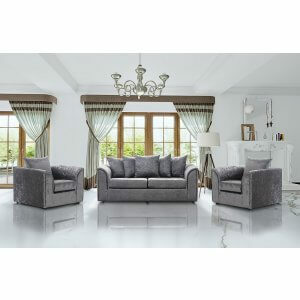 Mulberry Crushed Velvet 3 + 1 + 1 Seat Sofa Set •	Our Dorchester Range has a beautiful sculpted and refined design. •	Dorchester sofa comes with scatter cushions shown on the picture. •	Built in the UK on a hardwood frame with fibre filled seating for extra comfort. •	Upholstered in a crushed velvet effect and is a hard-wearing polyester fabric. •	High quality materials guarantee quality • Ottoman available on separate listing.